This article outlines how to create a new Division under an existing Company within the CRM. Sometimes businesses will acquire other businesses or start up a sister company. As a result it is important to ensure these new Divisions are linked to the parent Company. A good way of linking these is by creating the new Division under the existing parent Company. To create a new Division under an existing Company, you will first need to find the parent Company within the CRM using the Global Search. 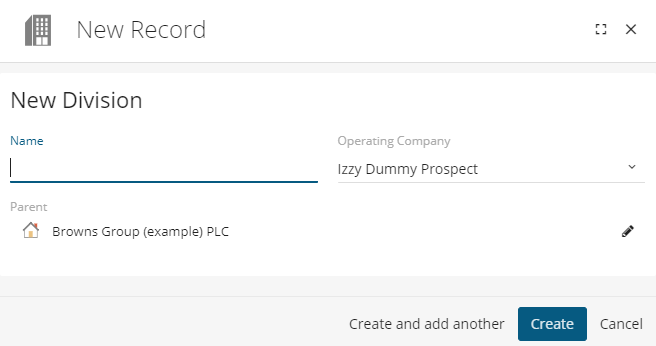 Once you have opened the appropriate Company record, navigate to the Divisions page. Within this page you can view the Divisions already logged underneath the Company. To create a new Division click on the + icon at the top of the page. After clicking on the + icon the New Record screen will open, where you can fill out the relevant information about your new Division. Once happy with the information entered, click create & you will then be able to fill out the additional fields regarding the new Divisions, such as SIC code, phone number & contacts that work at this Division.